Inspired by the award-winning poet and actor’s acclaimed one-man play, a powerful coming-of-age memoir that reimagines masculinity for the twenty-first-century male. Award-winning poet, actor, and writer Carlos Andrés Gómez is a supremely gifted storyteller with a captivating voice whose power resonates equally on the live stage and on the page. In one of his most moving spoken-word poems, Gómez recounts a confrontation he once had after accidentally bumping into another man at a club. Just as they were about to fight, Gómez experienced an unexplainable surge of emotion that made his eyes well up with tears. Everyone at the scene jumped back, as if crying, or showing vulnerability, was the most insane thing that Gómez could possibly have done. Like many men in our society, Gómez grew up believing that he had to be ready to fight at all times, treat women as objects, and close off his emotional self. It wasn’t until he discovered acting that he began to see the true cost of squelching one’s emotions—and how aggression dominates everything that young males are taught. Statistics on graduation rates, employment, and teen and young-adult suicide make it clear that the young males in our society are at a crisis point, but Gómez seeks to reverse these ominous trends by sharing the lessons that he has learned. 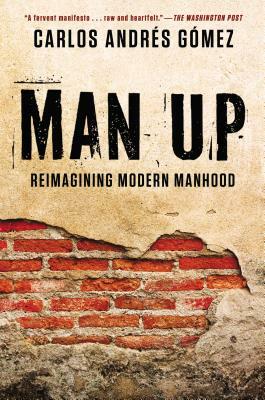 Like Hill Harper’s Letters to a Young Brother, Man Up will be an agent for positive change, galvanizing men—but also mothers, girlfriends, wives, and sisters—to rethink and reimagine the way all men interact with women, deal with violence, handle fear, and express emotion. Carlos Andrés Gómez is an award-winning poet, actor, and writer. He had appeared in HBO’s Russell Simmons Presents Def Poetry and costarred in Spike Lee’s Inside Man. He lives in New York City.